RP19809 is rated 3.0 out of 5 by 2. Rated 1 out of 5 by girlfriday from Not Chrome My contractor got acid on this product and it subsequently was damaged. I thought I was purchasing a chrome product-not plastic. Rated 5 out of 5 by ATHH from Good Product High Quality. Easy install. 2 questions: The photo of the chrome finish looks dark gray, not chrome. Can you confirm this is a typical chrome finish? Is it metal or plastic? 2nd question: What is the diameter of this escutcheon? 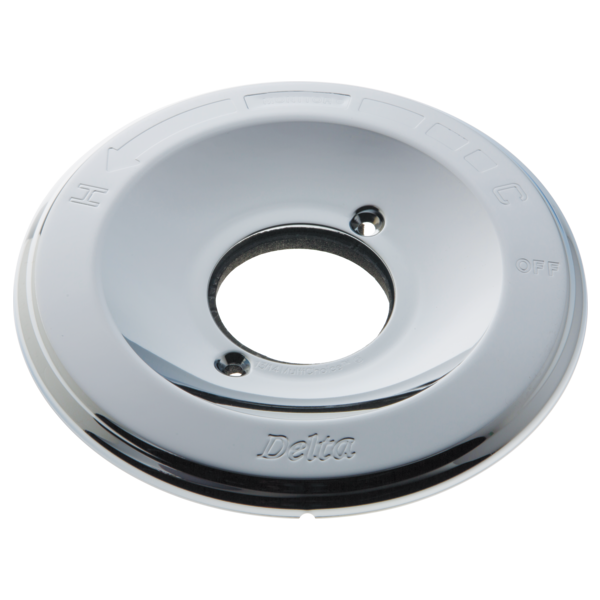 If it is 8&quot;, is it possible to replace my existing 7&quot; escutcheon of the same style with this 8&quot; one? There is a large space of cut-out tile (existing when I bought the home) that is exposed and caulk is not the solution for such a large gap. I think an 8&quot; escutcheon would cover enough that I could then caulk the remaining small gap. Is there a 9&quot; escutcheon that would solve this problem? I have seen the remodeler's plate and it is wider but not in the right location for my tile gap. Also, it is plastic, which I don't want. thank you! Does this come in a larger circumference? This is 8&quot; &amp; I need it 9 or 10&quot; to cover an existing hole cut in our shower marble. Suggestions? This part along with handle HC777 have been installed by my plumber into an existing shower. It fits and everything works properly, but it does not adequately cover the hole left by the previous hardware. The 20 year old faucet &amp; trim were square. I need a round trim that is about 1-2 inches larger that this one that would coordinate with the existing handle. Any suggestions? Thank you for your question. We offer a renovation plate when switching from a two handle faucet to a one handle faucet that may work for your condition too. Delta Faucet model # RP29827 covers up to 8&quot; center holes and is available in Chrome, Polished Brass, Venetian Bronze, and Stainless Steel finishes. Does this part RP19809 come in brushed nickel? Is this available in Venetian Bronze? The parts page doesn't list it as an option. The screws pulled through the metal and I need a replacement. I have Venetian bronze and would like it match. Thank you for your question. Delta Faucet model # RP19809 is available in Venetian Bronze. The model number is RP19809RB. Is this escutcheon plastic or chrome plated metal?